If you are looking for a second hand electric bass guitar that has killer vintage looks and bold shapes, then you might want to stop looking at the classifieds and consider getting the revamped Ibanez Destroyer Bass. It sports a vintage look combined with a pointy shape that will cater to most metal music bassists. What makes the Ibanez Destroyer special are the classic vibe vintage Gold hardware, which includes the bridge, knobs and machine heads. It gives the bass guitar a nice classic look. The humbucking split coils also come in vintage-vibe ivory for additional relic feel. 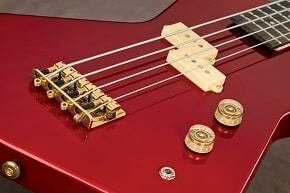 The Ibanez Destroyer Bass has a Mahogany Body with B10 Bridge. It features a rosewood fingerboard with pearl dot inlays. The 3 piece 864mm/34-inch scale Maple Neck has medium frets set up. As for it’s electronics, it is equipped with 2 Standard P Humbucking ceramic pickups that is controlled by a volume and tone knob. The Model number of the Destroyer Bass is DTB100, it will only be produced for a limited run. For more information regarding the Ibanez Destroyer Bass, head over to Ibanez.com.